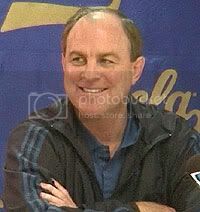 Those familiar with UCLA Coach Ben Howland's coaching philosophy understand the man is all about teaching basketball fundamentals and smart play. Subsequently, no one should be surprised that Howland, when asked what he thought about Russell Westbrook's dunk shot against Arizona, said, "He (Westbrook) dunks like that everyday and I don't think he's thinking about ESPN or Fox. On those shows they do not show jump shots - just dunks. That is what is promoted by the media. I, on the other hand, would rather see the good screen." Basketball geekdom is alive and well in Westwood, and Bruin fans are happy its centered here. Although Luc Richard Mbah a Moute had just 9 points and 2 rebounds against Arizona, Howland was still pleased with his junior forward's other contributions on the floor. "Luc was 5-5 from the foul line and played good defense as he always does," Howland said. "The turnovers were unfortunate. He is back in game shape. He has played in five games since he missed two weeks and I am confident he is back at full shape. He may still have some pain (in his ankle). Howland stressed the importance of the two remaining regular season games against Stanford and California and his team's quest for a high seed in the NCAA tournament. "Our primary goal is for us to win the Pac-10, to win it outright and that is what we are playing for on Thursday," Howland said. "We have no control over the seedings. Obviously, we would like to stay out West for the first and second round - that is what we have said all along." "I think we were a two-seed last year but we got to stay out West and we got to the Final Four so staying out West is very important to us. You play really good teams in the NCAA Tournament no matter where you are seeded: 1, 2, or 3. The parity in college basketball is so good now; I don't think there is much of a difference in playing a 7-10 winner or an 8-9. Having to travel East as opposed to Phoenix, Arizona is the big difference." After returning from the team's road trip to Arizona, Coach Howland had a chance to visit with Coach John Wooden at the hospital. Wooden is still hospitalized and recovering from broken bones he suffered after falling at his home. "I think Coach Wooden is in a lot of pain. His family is there with him basically around the clock supporting him," Howland said. "We talked for just a minute and I didn't want to be a bother. He was sleeping when I first got there. He kind of woke up just when I was leaving. He is really, really tough. He watched the Sunday game with Arizona on TV with his son Jim." Here we go Howland Here we go!! Take care of business buddy!! What I would give to be a fly on the wall when Coach Howland and the Wizard are in the same room! I imagine the wisdom must just permeate the room!